Frederick John (Fred) was born on the 4th of July 1887 in Fairlie, South Canterbury, New Zealand. He was the eldest son of Frederick Aldophus Slow and Mary Philedelphia Bell (nee Williams). Frederick Aldophus Slow and his brother John Alfred came to live in New Zealand in 1853 settling in the Wairau Valley. Frederick Adolphus Slow married his first wife, Jane White, in 1861. She was a widow and 17 years older than Fred. It is not known if she had any children. She died at the Porirua Lunatic Asylum in 1872. Frederick Aldophus Slow went on to marry Mary Philedelphia Bell on 25 August 1886 in Fairlie. Mary was born in Tavistock, Devon in 1858. She had previously been married to Alexander Bell and together they had three sons Arthur, Cameron, and Francis - the youngest of these was nine years older than Frederick John (Fred). 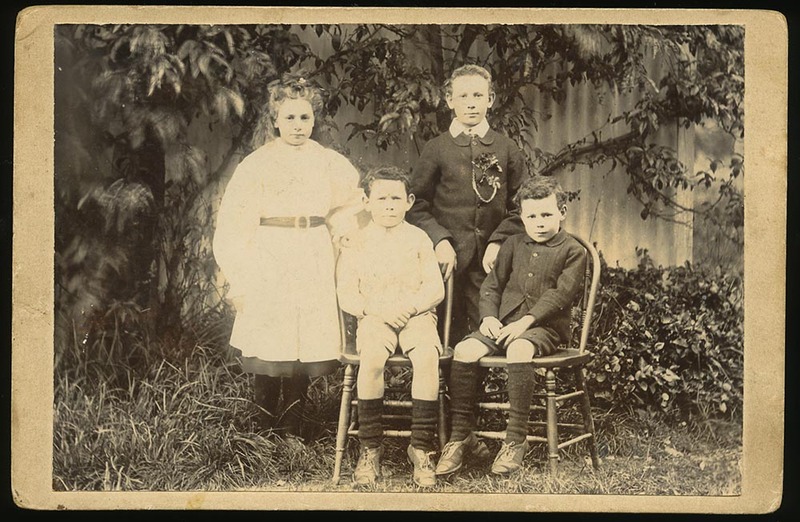 Fred had three younger siblings: a sister Maud and brothers Ernest and Ballance. All three brothers went overseas and served for New Zealand and the British Empire during the 1st World War. Ernest went to Gallipolli and returned in 1915, deemed medically unfit due to gun shot wounds to his thigh. Ballance served in France but luckily returned home at the end of the war. At the time of Fred’s enlistment he said he recorded that he was a horse driver/breaker for McEwan and Collier at Puketiritiri in the Hawkes Bay. He was 27 years old, 5’8” tall with brown eyes and fair hair, and a florid complexion. He is described as having a small mole on his centre back. He was listed as being Presbyterian (compared to his brothers Ballance and Ernest, who said they were Anglican). He enlisted on the 15th of December 1914 and trained at Trentham, Wellington for the standard 15 weeks training. He left NZ on the 16th of April 1915 with the 4th Reinforcements, New Zealand Field Artillery. Initially he was a gunner in the No 4 battery, but was promoted to Bombardier on 18 April 1915 whilst at sea. Like many he saw action at Gallipoli, embarking for the Dardanelles on the 20th August 1915. On 2 October he was shipped out again on the hospital ship Maheno “from Anzac” and was admitted to the 21st General Hospital in Alexandria, Egypt with enteric. On the 11th of October 1915 two telegraphs were received by his mother informing her of Frederick’s condition, sent on behalf of the New Zealand government. The late August 1915 offensive was a failure and the battle reached a stalemate. The ANZAC’s evacuated Gallipolli in December 1915 and returned to Egypt. 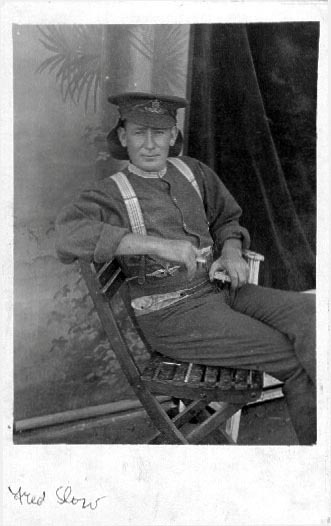 After Fred’s recovery he was admitted to the convalescent depot in Luxor in Egypt on 28 November and was discharged for duty at Zeitoun on 1 December. Zeitoun was where the New Zealanders camped just outside Cairo. On 7 April 1916 he left Alexandria for France aboard HMT Eboe. He had transferred to the 5th Battery. During his service Fed sometimes ran afoul of military discipline. At Rouen on 24 April Fred failed to turn up for 6am parade arriving eventually at 11.30am. The reason was recorded as drunkenness. For this he received a 91 day punishment at the Field Punishment Centre Number 1. This was located at Havre. He was also reduced to the ranks from Bombardier to Gunner on 3 May. On 23 July he re-joined his Battery at Port de Nieppe after receiving 15 days off for good behaviour. The battle of the Somme started on the 1 July 1916. As a member of the Field Artillery, Fred would have been working hard to support other units activities. By October the fighting centred around Transloy, Ancre Heights, Thiepval, and Le Sars. The rains came that month and the cold and the mud and the surface ended up freezing. In October Fred died at the 15th Corps main dressing station near the village of Becordel-Becourt, as a result shell wounds to his left arm and right leg. It seems he may have been wounded around Le Transloy where the New Zealanders were fighting at that time. Fred’s service record indicate he died on 21 October. However the NZ Field Artillery diaries record he died 2 days later. (Diaries sighted at NZ Archives, Wellington Ref WA 52/1 War Diaries NZFA 2nd Brigade Oct 1916). Perhaps the explkanation is that he was wounded on 21 October, but he only died on 23 October. On the 30th of October 1916 a telegraph was sent to his mother informing her that Fred had died of wounds. Sadly Fred’s half brother Cameron Bell had also died in September 1916, further compounding the family’s tragedy. Fred was buried at the Dartmoor Cemetery, Becordal 1 ½ miles south east Albert. Later, a photograph of the wooden cross erected for Fred was sent by the Minister of Defence. He is buried in Plot 2 Row E Grave 12. Fred’s personal possessions were returned to his mother, including his ID tag. His final pay was calculated and along with the money in his possession at the time of his death which was 8 shillings and 7 pence. This was paid out to his mother, a total amount of 163 pounds and 7 pence. Fred is remembered by his family, and on the war memorials at the entrance to Fairlie School, the Fairlie War Memorial, the South Canterbury Memorial Wall in Timaru, and on the war memorial Taradale in Hawkes Bay.